Everybody loves to cool off on hot summer days. 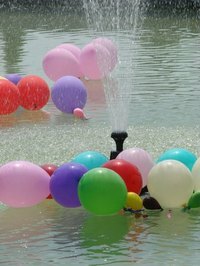 Water and balloons are a combination for summertime fun that never goes out of style. Children and adults alike enjoy the fun of tossing water balloons to each other, the sensation of relief when the balloon breaks and splashes cold water on them and the challenge of preventing the balloon from breaking for as long as possible. Include water balloon games at children's birthday parties. This is a fun game for teenagers on a hot, summer day. It is similar to "pass the orange" and is great for summer birthday parties for children ages 13 to 16. You need a supply of long, thin balloons for this game. Fill them with water ahead of time. Set up two identical obstacle courses; they can be as simple or as complicated as you like. Good ideas include walking on a two by four without letting feet touch the ground, sitting in a chair before standing back up and stepping into a hula hoop on the ground and turning 360 degrees. Divide the party guests into two teams. The first person on each team holds a water balloon under her chin and attempts to complete the obstacle course. If she drops the balloon at any time, she must restart that section of the obstacle course. For example, if she successfully walks along the two by four but drops the balloon while rising from the chair, she must get a new balloon and sit back down in the chair. When she has completed the obstacle course, she must pass the water balloon under her chin to her teammate; they are not allowed to use their hands. Towel Toss is a water balloon game great for elementary age children up to adults. Divide party goers into teams of four and each team into two sets of pairs. Each pair receives a towel to hold in between them. The players toss water balloons back and forth from one towel to the other and attempt to not break the balloons. The team with the fewest broken balloons at the end wins. Another way to play this game is to divide partygoers into pairs and give each pair a towel to hold between them. Have the participants form a large circle. The teams pass the balloon from towel to towel around the circle. Circle Towel Toss is a cooperative game that encourages cheering for each other and helping each other. It works best with small groups, so if you have a big party you may want to create more than one circle to play this game. Young children can enjoy water balloon games on hot summer days as long as the game is not too rough. Because toddlers tend to put everything in their mouths, water balloon games are potentially dangerous. If children under the age of three are playing a water balloon game, then a diligent adult must be present to remove pieces of balloon when they break. Adapt the bean-bag toss game to use water balloons. If you already have a bean-bag toss board (the box or board that the bean bags get tossed into) consider simply using it with small water balloons. Other ways to do this include placing Frisbees upside down on the the lawn and placing a yardstick on the grass for children to stand behind. Players stand behind the yardstick and toss water balloons toward the Frisbees. With younger children it is better to not keep score but rather to simply enjoy the sensation of the holding and tossing the water balloons.